Sales Consultants who are involved in Selling Profession realize that account management is key to success of any company. Account Management is in a direct relevance to Pareto principle- 80% of revenues come from 20% of clients. The key lies in the fact that every sales representative should know what goal he has to achieve with in the each call, before they are going to visit their respective clients. Each sales representative should plan their efforts accordingly to get hold of potential consumers. Let us assume that you are selling an IT Solution and you are given a product portfolio and some accounts. How would you go about it. Let's define some steps to achieve effective selling. 3. 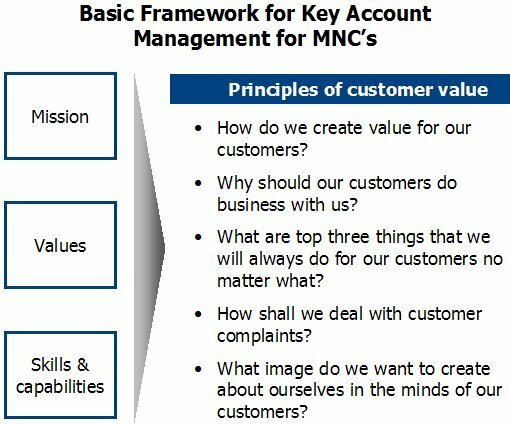 Account Mapping:- Key stakeholders in the Selling Process----> Research on the individual's objectives, criteria of measuring down things for selection. Identify a stakeholder that can become endorser of your products and services. Ask these questions- How you and your company would benefit out of this transaction? For example:- What your customers want- Opex Vs Capex ? 4. Key requirements of your clients and required services- Plan a road map to achieve the requirements. 6. Overcome the concerns and present a Solution to customers. 7. Settle down on KPI's for account evaluation and a platform to get concerns from your customers.